This is 28mm/30mm-scale terrain for wargaming, roleplaying games, miniature dioramas, skirmish games, model railroads, class projects or just for fun. Assembling this model requires 11 sheets of cardstock (110# or 199gsm recommended), scissors, a sharp hobby knife and ordinary paper glue. It's perfect for gaming. There's room for several miniatures on the deck and on the balcony. The passageway offers a great choke point for wargame scenarios, and it's sure to become the centerpiece for some interesting encounters. It works for lots of different settings. It should fit right in with any fantasy, Victorian, steampunk or medieval setting. It's easy to build. All of the shapes are easy to assemble on their own, and everything goes together very simply. 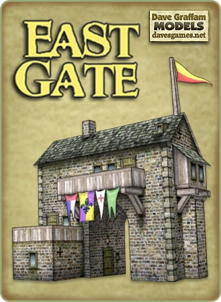 You can build the East Gate in about an hour and it's ready for play. The step-by-step assembly instructions will walk you through it. You'll also find assembly tips and advice for printing at various popular gaming and model railroad scales. The graphics are all presented in high-quality 300dpi, so they'll look great no matter what size you print them. You'll need Adobe Acrobat Reader 7.0 or later to view these files. Contents: This product is a PDF that you can print to cut out and assemble this papercraft model. It includes banners that you can place anywhere, a short flight of stairs, two window dormers, a tiny roof dormer, a chimney, flagpole, flag and more. Dimensions: The East Gate's footprint measures approximately 10.25" x 6.8", and it stands about 11.5" tall at the top of the flagpole. An optional ground piece is provided for extra stability, and it measures about 12" x 8".